Les Mills Smartbar is a weight set with bar that includes 2 x 2.2lbs, 2 x 5.5lbs and 2 x 11lbs weight plates (1, 2.5 and 5kg). It is created by the Kiwi company Don Oliver Fitness Equipment Ltd. (Kiwi = New Zealand) and Less Mills is a truly global brand with presence in more than 100 countries worldwide, partnering with more than 1850 fitness clubs and training over 9000 fitness trainers and when the company is testing a new product they always ask for the expert opinions of many pros and instructors. Smartbar is suitable for both the newbies and advanced trainers and can easily be used in studio and group classes, boot camps or one-on-one training sessions. Les Mills Smartbar is a very good quality and durable product as it is made of Zytel which is abrasion and impact resistant and high strength. Weights do not chip, rust or ever need to be painted because they have iron sand inside and are coated with polyethylene. The only con to point out would be its not so cheap price but you will see it is worth more than its price tag- for its great multi-functionality, durability and quality overall. You’ll get 20-30% better workout than regular barbells or dumbbells as you can do barbell training, dumbbell training, whole body metabolic resistance workout, dynamic core training with smart training tools, use a tubing for more resistance, more range and more exercises- it is an all in one to help you push more by handling heavier weights and fatiguing your target muscles. The gator or the head with retractable teeth at both ends of Smartbar is able to hold as much as three weights and you can swiftly and smoothly change them due to the great ergonomic design and the gator rotates for easier and smoother form and movement and easier transitions. What happens is you just slide the plates on the bar and they will lock into the gator and pull the lever to release the weights and they will come off quickly. You can hold any of the weight plates provided thanks to the ergonomic grip in the middle and you can add more plate and have two in your hands if you’re looking for more challenge and you’ll be able to do longer and harder sets before your fingers and wrists are fatigued. 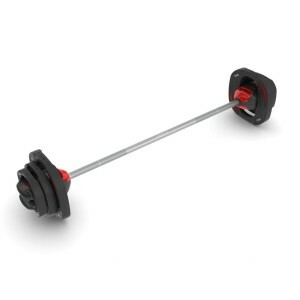 There are no clips on the Smartbar weight set so the transition between weights is very swift, smooth and easy. You don’t have to go straight from 5.5 to 11 lbs you just go in small steps by adding the 2.2lb one first to the 5.5lb plates. It is nice being able to add weights little by little and you can target both the large muscle groups and the isolated muscles. The bar itself is lightweight as it doesn’t have that extra length on the sides but feels very strong and durable. You won’t be damaging the floors in your flat or gym like the metal weights might. We like the sleek square design and the way you can put the weights on and take them out with easy release function and you can easily do that by just one hand. It doesn’t occupy much space at all and you may keep it just in the corner of your room or under your bed. Les Mills SMARTBAR weight system is offered with a two year warranty as an indication that the company stands behind this great product.